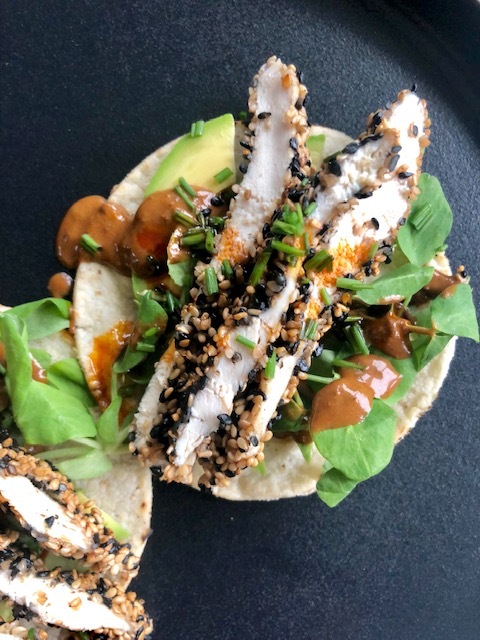 These tacos were super quick to make – definitely something you can make for a weeknight dinner. You can take some shortcuts with the beans and mole. I make my own beans ahead of time and just put them in a tub ready to go for recipes. On the mole, I do the same thus this time around I was out – so I store bought! I know, it’s sort of cheating though it’s okay and you can do the same. When it comes to weeknight meals, I do take shortcuts when possible. I want to sit down with my family and enjoy the meal. I think that is where most of the time should be spent. We rush throughout the whole day and only see each other early in the AM and late PM. Our meal moments are crucial, its where all the sudden our son tells us a joke he learned from school or our daughter first uttered the word gracias (she is 1). I hope you get to enjoy these with your loved ones and don’t worry too much on how things turn out, just enjoy the company. Beat the egg whites until well mixed but not foamy. In a flat plate mix the sesame seeds. Set your chicken out and pat dry. Salt and pepper then pass through egg whites. Set one by one in the sesame mix patting it and covering chicken completely (like you would if you were breading it. Set in another plate and keep on going until you got them all completed. Heat up oil in nonstick pan and fry the chicken. It will take anything from 10 – 12 minutes. Set aside. Once your chicken is cooled down for about 5 minutes, slice lengthwise and its ready to serve. To assemble, heat up tortillas in high heat. Set 3 thin slices of avocado. Add a bunch of protein greens and drizzle mole bean salsa. Top with chicken and sprinkle chives. Provecho!